$1.714 million on 1769 screens. With a tale ripped from the headlines – and with a rising young star in the lead – one might’ve expected 2013’s The Fifth Estate to become a hit. Nope – it got generally weak reviews and despite a fairly wide release, it mustered a mere $3 million at the box office. Despite these negatives, I figured Estate had enough potential to give it a look. After a 2010 prologue to show the impact of WikiLeaks – a group that publishes classified/secret information on the Internet – we go back to 2007 to view its formation. At a Berlin conference devoted to “chaos communication”, Julian Assange (Benedict Cumberbatch) and Daniel Berg (Daniel Brühl) meet up and further their human rights agenda. Both had been involved in exposing “global corruption” on a smaller scale, but now they set their sights higher. With Julian as the “idea man” and Daniel the head of technology, they team to spread their philosophy of informational freedom. We follow those exploits and the repercussions that come with their endeavors. Within the Assange/WikiLeaks story, there’s a good movie to be made. Unfortunately, Estate isn’t that film, largely because I think it takes the wrong approach to the subject. At its heart, Estate wants to be All the President’s Men. It treats the material in a semi-documentary fashion and tries to draw us into the tale via dramatic intrigue and a thriller framework. That worked for President’s Men because the narrative suited it. Woodward and Bernstein’s investigation started slowly and built to a crescendo, which allowed the film to develop real drama. On the other hand, Estate lacks much of the same natural suspense and tension. Why treat the material as a thriller? I have no idea, as the tale suits a more character-based feel ala Social Network. Instead of that take on the material, director Bill Condon tries his best to turn a tale of two guys on laptops into a Bourne flick. He makes everything as urgent as urgent can be; we get incessant use of shaky handheld camerawork along with pulsing music and rapid-fire cuts. At times, the story may deserve this treatment, as it does get into threats encountered by its participants. Too much of the time, however, the filmmaking techniques feel like forced attempts to convince us we’ve found an exciting, vital story. We haven’t – at least not as depicted here. As I mentioned, a more natural bio-pic depiction ala Social Network might’ve succeeded, but Condon’s choice to make this a thriller flops. Estate also spreads itself far too thin, as it delves into a slew of extraneous and distracting subplots. Areas that should appear as brief asides become major diversions and don’t contribute to the story. Perhaps those would’ve worked in a longer mini-series approach, but in a two-hour-ish edition, they end up as superfluous and superficial. Which means Estate misuses an excellent cast. In addition to those already mentioned, we find talents such as Laura Linney, Anthony Mackie and Stanley Tucci, all of whom get to do precisely bupkis. Perhaps the movie cut down their parts and they would’ve been more useful in a longer edition, but as it stands, they feel wasted. As for our lead, Cumberbatch delivers a fairly interesting portrayal of Assange, but I can’t claim he helps us understand the character. That’s mostly the script’s fault, though. The screenplay engages in some pop psychological views of Assange but never gives us an idea of what makes him tick. All of these elements leave Estate as a major disappointment. With an intriguing story and plenty of talent both in front of and behind the camera, this should’ve turned into a top-notch drama. Instead, it tries desperately to entertain us despite its absence of substance. 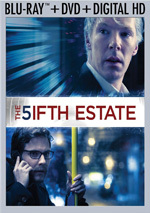 The Fifth Estate appears in an aspect ratio of approximately 2.40:1 on this Blu-ray Disc. This became a mostly strong presentation. Like so many modern films, Estate opted for a palette than favored teal and orange – especially teal. As tiresome as those choices can be, they came across appropriately here. Blacks were dark and dense, and low-light elements showed positive clarity and delineation. I felt pleased with the image. Though not tremendously ambitious, the film’s DTS-HD MA 5.1 soundtrack worked. The soundscape emphasized music, as the score cropped up actively in all the channels, including active usage of the surrounds. Effects demonstrated less involvement but they added good atmosphere and immersiveness throughout the film; while they lacked standout elements, they contributed useful ambience and popped to life well during a few showier sequences. Audio quality always seemed strong. Music was dynamic and full, with clean highs and deep lows. Effects also showed nice clarity and vivacity, while speech was natural and concise. This remained a pretty good mix for the subject matter. A handful of extras flesh out the set. The Submission Platform: Visual Effects goes for 10 minutes, 25 seconds and gives us notes from director Bill Condon, production designer Mark Tildesley, screenwriter Josh Singer, VFX supervisor John Bair and VFX producer Renuka Ballal. The show looks at set design and the use of various effects to involve us in the “world of WikiLeaks”. We find a pretty tight, informative take on the subject matter. In-Camera Graphics lasts six minutes, 25 seconds and features Condon, Tildesley, and computer graphics supervisor Andrew Booth. “Graphics” follows the same visual issues discussed in “Platform” but does so from the POV of practical elements. Like “Platform”, this becomes an engaging overview of the topics. For the final featurette, Scoring Secrets occupies nine minutes, 11 seconds with details from Condon and composer Carter Burwell. As one might expect, “Secrets” looks at the film’s music. We find another useful featurette that digs into the score well. The disc opens with ads for Delivery Man, Need for Speed, and Thor: The Dark World. Sneak Peeks runs the same clips. We also find the trailer and seven TV spots for Estate. A second disc offers a DVD copy of Estate. This includes the “Submission Platform” featurette as well as the trailer and TV spots. One of 2013’s bigger disappointments, The Fifth Estate fails in almost all regards. It boasts terrific potential but suffers from strange filmmaking choices and a story that wanders everyplace other than where it needs to go. The Blu-ray delivers good picture and audio as well as a few informative bonus materials. I can’t endorse this forgettable, superficial drama.